← The AAR’s Religious Values? 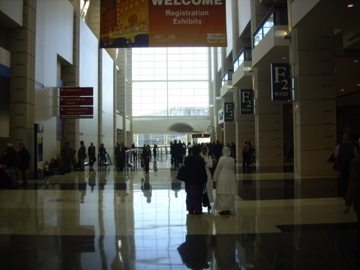 Many with whom I spoke at the conference experienced fatigue as well after a 3-4 day marathon navigating the massive terrain that is McCormick Place convention center in Chicago’s downtown. Yet their additional “experiences” seemed to differ on many fronts, depending on their job positions (or lack thereof), their financial situation (e.g., did they stay at the Hilton or the Best Western, was their trip funded or not, etc. ), their purpose as scholars (e.g., social justice, strict social science/theory, etc.) and so forth. This entry was posted in Matt Sheedy, Religion and Theory, Scholarship on the Road, Theory and Method, Theory in the Real World, Uncategorized and tagged AAR, Buddhism, Religious Experience. Bookmark the permalink.